These days when I see a room that inspires me I usually save it for pinterest. However, this room deserves so much more than just a pin that gets buried within a board. 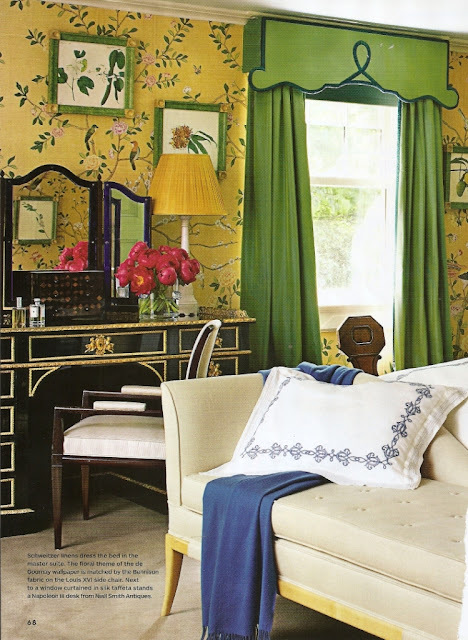 Almost every aspect of this bedroom by Miles Redd inspires me -- the beyond amazing valance, the botanical prints against the floral theme de Gournay wallpaper and all of those elements mixed perfectly with a stunning a ebony Napoleon III desk/dressing table. What element of this space inspires you? I love the dressing table! The classy black perfectly balances the amazing floral wallpaper. It's glamorous,feminine, and classy all in one. I agree that this is more worthy than just pinterest. This room is stunning. I love how the green curtains play against the yellow floral wallpaper. Make me want to get me some yello wallpaper. Unique photo, unique elements, unique room! Wow amazing room is looking very beautiful and unique specially dressing table is very beautiful. Oh my. I can't get beyond the valance to notice anything else. It's amazing AND it's green. A gorgeous green. I'll have to come back later and take it all in! I then leapt beyond my mattress to look Air swimmers soothe your ex. I noticed they wanted to be snuggled Remote controlled flying therefore i introduced your pet to sleep with me Radio controlled fish. The subsequent slumber above,Flying fish toy my mother place your pet to settle in his crib and once he or she drifted off My spouse and i scooped him upward and also introduced him to sleep with me at night. The wall paper, decor,curtain all looks really beautiful. But the one thing that caught my attention is the sofa. The way the sofa leg is done up to match the wall is really interesting. So excellent post , Man .